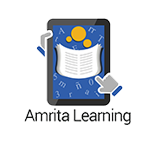 AmritaCREATE, Amrita University has pioneered technology enhanced learning for K12 Schools & Higher Education in both formal and informal settings and in Health Awareness and Monitoring Systems. Large scale projects developed and deployed across India include Amrita Rural India Tablet enhanced Education (RITE) in remote villages, Intelligent Tutoring Systems for School Education, eGovernance Systems for Schools, Big Data Analytics in Education, Health Awareness and Monitoring Systems and Simulations and CASE Based environments for Medical Education. AmritaCREATE, Amrita University is the recipient of the Digital India Award from the Hon’ble Minister of MeitY, in the Category – Digital Empowerment (2015). Other awards include best journal paper, IEEE Transactions in Education (2014), IT Excellence Award for eLearning and Education, Computer Society of India, (2013). AmritaCREATE, Amrita University’s technology is deployed in 22 states across India, with impact via. 52 remote and rural village centers. Over 11,000 teachers have been trained with 300,000+ students impacted in schools and universities. Inspired by Amrita University's Chancellor AMMA, Dr. Prema Nedungadi and a team of educators and developers have created Amrita Learning, a personalized learning app along with engaging, culturally appropriate e-content linked to life skills. Download the Android app here. Sri Mata Amritanandamayi Devi (Amma) is a world-renowned humanitarian and spiritual leader. Amma is founder the vast humanitarian mission known as the Mata Amritanandamayi Math, and NGO with consultative status at the UN-ECOSOC. Mata Amritanandamayi Math has built more than 45,000 homes for the homeless poor throughout India, is currently providing scholarships for more than 51,000 impoverished children and has helped more than one lakh poverty-stricken women and form self-help groups, and much more. Amma is founder of Embracing the World, a multi-national collective of not-for-profit organizations dedicated to humanitarian work in the fields of human rights, health, and well-being, including food, access to water and power, housing, medical care, and the right to education and skill-training. Amma is founder and chancellor of Amrita University, the #1 Private University in India. Amma’s concept of education, stress on research and commitment to instilling universal values have come together to shape Amrita University into an institution where the latest advancements and discoveries combine with compassion and service-mindedness. Dr. Prema Nedungadi, Kathryn Devenport, Rita Sutcliffe, Dr. Raghu Raman and other members of AmritaCREATE team @Amrita Vishwa Vidyapeetham.